Some editions of Windows 7, i.e. Windows 7 Ultimate and Windows 7 Enterprise can officially more than one display language, which determines what localized languages are been used to display text in wizards, dialog boxes, menus, Help and Support topics, and other objects in the user interface (UI). 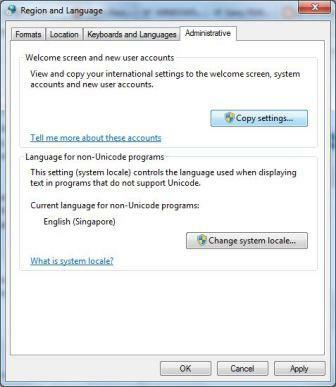 Display languages can be added and installed in Windows 7 with MIU (Multilingual User Interface) or LIP (Language Interface Pack) language packs. 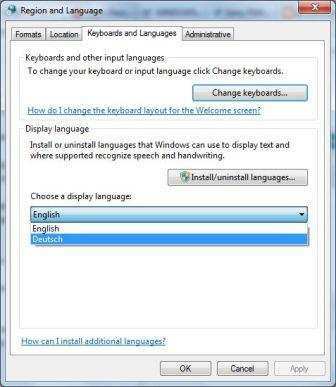 Other than directly change display language after installing new display language, when there is more than one display languages installed on Windows 7 system, users can change and switch display language manually or on ad-hoc basis using steps below. In Category view, click on Clock, Language, and Region link, and then click on Change display language link under “Region and Language” section. In Icons view, click on Region and Language icon, and then go to Keyboards and Languages tab. Under “Display language” section, choose a display language from the list of installed language packs. Note: If no list of display languages is shown, make sure that you have installed additional language packs as the list will only applicable if there is more than 1 display languages available in supported editions of Windows 7. The system’s user interface is now been converted and switched to new display language selected. Logout and login again or restart computer to see the change. Note that the new display language is applied for existing user account only, but not to text on welcome screen and system reserved accounts, nor set as the default display language for new user accounts create in future. 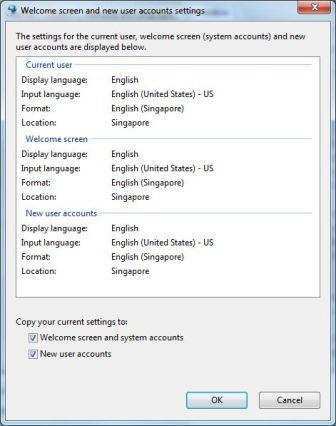 To change the display language in Windows 7 welcome screen and special reserved system accounts used by Windows services (local system, local service, and network service), and set the current display language as the setting for new user created, continue with steps below. It will also set current display set as the display language for users who haven’t specified a display language. In the “Region and Language” dialog window, click on Administrative tab. Under “Welcome screen and new user accounts” section, click on Copy settings button. In the “Welcome screen and new user accounts” dialog box, select and tick the check boxes for Welcome screen and system accounts and New user accounts.